Welcome to the Lovely Cynthia Lennon website! "In Her Own Words": An article from the Beatles fan magazine "Norwegian Wood" has been added to this section. Read it now! -now in english! Order "John": You can still order "John," Order Now! or Buy Now! through Amazon.com. Special Project: We need the fans help! Would you like a to see a film or movie about Cynthia? If so, then please read more, and help to make it happen! Cynthia Greetings! Send a Cynthia Lennon Greeting to your friends... Send Now! If you would like to add something to the site or have any questions, please contact us! 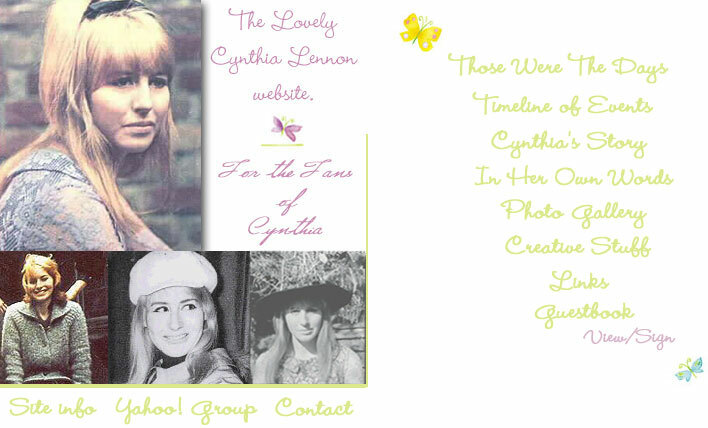 Designed and Created ©2000-2007 The Lovely Cynthia Lennon site. The following pages may not be re-copied in any way at all. This is a Fan Site for Cynthia Lennon, for Fan's of her life and art work. This page is in no way associated with any other Cynthia Lennon Site on the internet or Cynthia Lennon. Best viewed with Microsoft IE.